Modern languages lessons will be available for pupils in every primary school in England by the end of the decade, the government said. A target for an entitlement to language lessons for every child from the age of seven upwards by 2010 was announced on Tuesday. There will also be 200 more specialist modern languages schools for secondary pupils, to be created in the next three years. The government wants staff at specialist language schools to help out at neighbouring primaries. It promises to start by training 200 extra languages teachers next year. The initiative follows an outcry about government plans to make modern languages a non-compulsory subject in its Green Paper review of the curriculum for 14 to 19 year olds. This is expected to be part of the "freeing up" of the curriculum, as the government seeks to make space for vocational subjects. For many years, schools in England have been seen as lagging behind in teaching languages - with many disparaging contrasts drawn with the language skills of pupils in other European countries. For example, in Germany it is compulsory to learn English from the age of seven. At the age of 12, they start a second language and at 14 a third language. In France they start a foreign language at nine - usually English or German. In Italy it is compulsory from eight. On Monday, ambassadors from Germany, France, Italy and Spain issued a joint plea for language teaching in England to be improved. German ambassador Hans-Freidrich von Ploetz told BBC News: "You are selling in European and global markets - but you are hardly ever able to speak the languages of your markets. "In the job market, your youngsters are competing not only with other English or British youngsters, but also European and beyond." 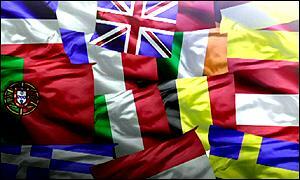 Only one in three British teenagers speaks a foreign language. And a representative of the engineering industry, also speaking on Monday, had warned that deals were being jeopardised by the lack of language skills in the workforce. A report from the Nuffield Foundation into language learning in the United Kingdom found "deplorable monolingualism" and called for languages to be taught in primary schools. In England this now seems set to happen, but the long-term target for its introduction reflects the difficulties in achieving language lessons in all schools. There has been a shortage in languages teachers - and students have been offered cash bonuses for signing up to train to teach in the subject. There will also be questions about how an extra subject will be introduced into the crowded primary school timetables.